It seems last few weeks, I didn’t have a clue what to write, and this week has been nothing but writing. I just finished writing my portion of our Cherished Women’s Bible Study for the month. I finally finished the rewrites on my latest book project and have one more final read through now that it has been graphically laid out before it goes to print. Can I get an AMEN?! Glory, Hallelujah!!! Our Cherished Women’s Ministry theme for this year is Awaken; and so, this month’s topic is Awaken to your Creativity. I have had the word Awaken on my brain for the last several months. As I was praying about what to write about for this week’s post, I knew I wanted to share with you about something I have just started doing. I guess you could say that I have recently been awoken to a new way to study the Bible. I know that Bible Journaling has been around for a while, and it may be hard to believe that I had never heard about it until about 3 months ago. However, it’s true. I have this new friend, and she invited my family to her home for dinner. After dinner we were visiting and continuing to get to know one another, and she started talking about art journaling. I think the look of confusion on my face was enough for her to understand, I had never heard of such a thing. So, she was trying to explain what it was like. She went on to explain how it was similar to Bible Journaling. Again the perplexed look on my face led her to show me her art journal. It was Ah-mazing!!! So, I asked her about her Bible Journal. 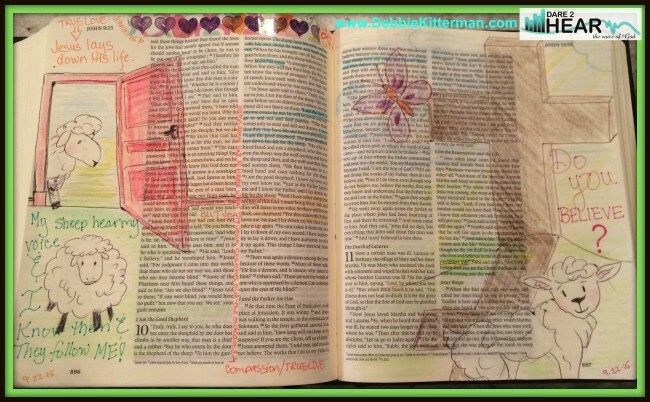 She said she had never really done actual “Bible Journaling,” with a Bible Journal Bible, but she showed me other forms of similar Bible Journaling she had done. I told her I needed to know more about this “Bible Journaling” thing she was talking about; she directed me towards her Pinterest boards, and we set up a meeting for the following week to talk about it some more. Long story short – I was so intrigued by this new creative way of studying the Bible, I bought myself an actual Bible for the sole purpose of Bible Journaling. I was excited; I began collecting all the art supplies – OK, mainly pens in a variety of colors. However, every time I went to sit down to actually journal in my new Bible, I didn’t. You see; I was afraid. I was afraid of making a mistake or drawing a dorky looking picture or it not looking beautiful like all the ones I had pinned on Pinterest. Oh boy, and let me just say that there are some amazingly gifted and talented artists out there. WOW. Well, another friend of mine saw all my new pins on Pinterest and sent me a text message asking if I was starting to Bible journal. I explained I was attempting to journal, working up the nerve to actually begin. She sent me several pictures of things she had done for her Bible Journal and told me to bring my stuff when I would be in town visiting for a day and she would help me get started. I have the coolest, most talented, giving, and gifted friends ever! It was fun, even though it took a while to “create.” It was worth it. I can tell you all the things I would change about it to make it look better; but the point is, I actually started – I didn’t let the fear get to me and didn’t let the need to have it perfect stop me. I just did it. I was so excited for this new creative way to be in the Word of God, but it was at least another month before I sat down to do some more. As I was writing this month’s Bible Study for our church, I kept finding myself coming back to this new way to study the Scriptures. Something different than just reading my Bible, or journaling about a verse. 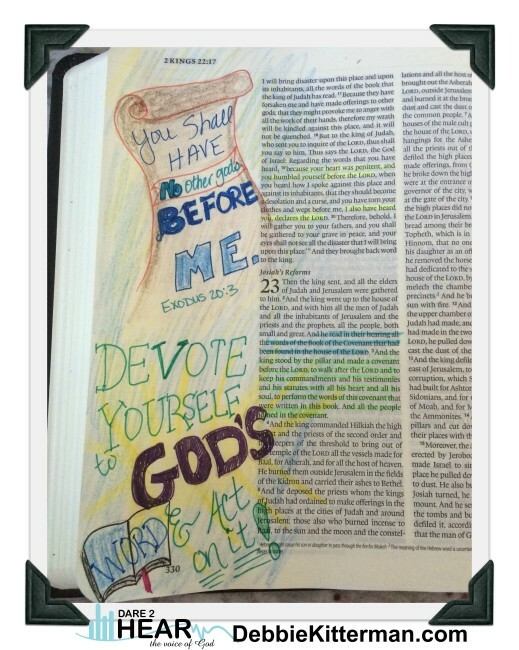 Bible Journaling had me looking at Scriptures differently. As I would read a passage of Scripture, I would jot down a verse or a phrase that stood out to me. When I was done reading the Scripture, I would ask God to show me a picture that could represent the theme, verse, or phrase I had in my head. I didn’t let the fear get to me and didn’t let the need to have it perfect stop me. I just did it. God has always been faithful to show me a picture that represents the Scripture well. My problems was recreating the beautiful image that I could see on the screen of my imagination and get it on paper. 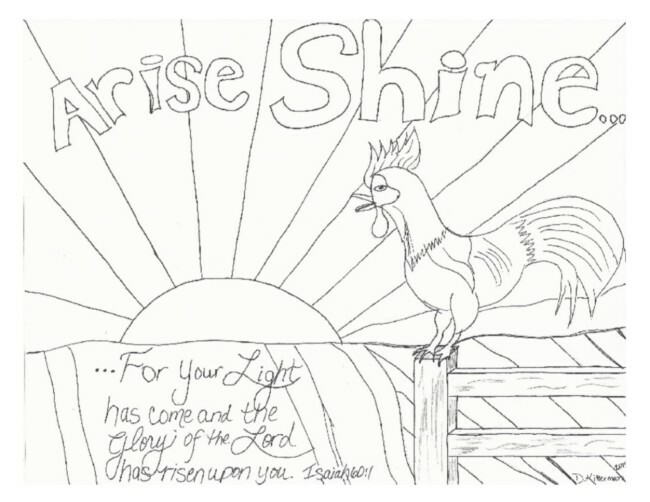 Google search has become my new friend, as I search how to: draw a door, a cross, a rooster, and the list goes on. I can do stick figures really well, but I wanted to attempt to get in touch with the creative artistic child that was still inside somewhere. I didn’t want a one dimensional cross; I wanted a multi-dimensional one…. I don’t always have time to sit down and draw pictures, but I can still doodle in my journal or sketch out thoughts, playing around with different fonts and lettering to make studying the Bible a little more fun and exciting. I have found that I am getting new revelation around Scriptures that I have read many times before. I am excited about this new avenue to study the word and get in a little creativity as well. CREATIVITY is Not a Mood. Creativity is Not a Gift. It’s the Very Nature of God Inside of You. Since we are made in the image of God, we have His characteristics and His very nature inside of us. His very Nature – His DNA –is in each one of us. Since God, our Father, is a Creator, we, too, are born to create. It got me thinking to when I was a little girl and when I would create all the time. I would draw pictures, color, finger paint, write poetry, and creative short stories, etc. What happened? I enjoyed those things, felt alive and free, when I was being creative; however, somewhere along the way I stopped. Maybe life got busy, or maybe, I was insecure and began comparing myself to others who could draw better, write better… Or, maybe someone told me I wasn’t good at something; and so, I believed them? Or…. When I am stressed, doing something creative, being creative, eases the stress and allows me to relax. When I am creative, I feel free and alive. When I can be creative I am more productive in the menial tasks that need to be accomplished. If I go a long periods of time without being creative, I get frustrated, irritable, and I have a hard time focusing on tasks at hand. Now, I let my creativity flow in other areas, I paint furniture, I decorate my front porch, I create graphics for flyers, announcements, and picture images for my blog. I have even begun to bible journal. Did you know that the use of crayons in adulthood is beneficial to your health? If you haven’t even done Bible Journaling before, I encourage you to give it a try. You don’t need a special Bible, just grab a notebook, a journal, or even a piece of blank paper and give it a try. Don’t have time – go ahead and print out this Bible Art Page that I created for our Women’s Bible Study teaching around our theme verse for the year. Grab that box of Crayola crayons – breathe deeply – embrace and AWAKEN the creativity that God has placed inside of you. I just LOVE gifts, and I love free stuff too. So, as promised, one blessed person will win their very own copy of the book The Chase. Keep it for yourself or give it as a gift to someone else – Christmas is only 11 weekends away!!! 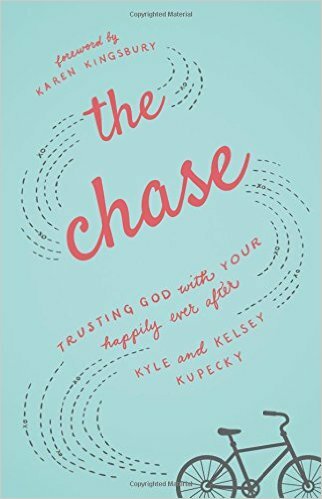 Don’t forget to go comment and share the Book Review Monday post from September 28th to enter for your chance to win a copy of The Chase by Kyle and Kelsey Kupecky. Plus while you are there, use the Raffle-Copter for extra chances to win. I had never heard of this before! What a beautiful legacy your Bible will become to the generations after you! I actually have a journaling Bible, but never thought to draw pictures in it. I am not an artist by any stretch or even a sketcher, but you made me stop and think because when I was younger, I would always draw pictures of houses and scenery. I would crawl into the pictures. And like you, I don’t know why I stopped drawing. I think by drawing from a word picture in the Bible, it would use yet another learning style to cement God’s Word into our hearts and minds. I am counting on it my friend – I mean how often will we be in the same place since you are 5 hours away now! See you soon. Besides after teaching most of the weekend, I will need to be creative and refreshed! Refreshing! The memories that your blog stirred in me are like a small child waking from a deep sleep. When the child opens her sleepy eyes, a rainbow on butterfly wings is there to meet and amaze her. There, color meets impossibility to become probability. I miss being a child and seeing the world through those eyes! I’ve wondered, too, where my creativity went. I think I will pull out the box meant for my grandchildren, find my favorite color-periwinkle, breathe deep, and smell the crayon. Something wonderful is bound to happen! Thank you for sharing about bible journaling. I had never heard of it either. I think it’s fabulous that as busy as you are, you find time to let the ‘creative you’ come to life. You’ve inspired me! Kaiserk – I am so glad you are and were inspired! Yes find that periwinkle – take a deep deep breath and then color and be creative! Thank you so much for visiting my blog today! Many blessings to you. Thanks for great link up. Will get your link to my posts as soon as possible. Let’s see where this Bible Art Journalling leads us. All I can say is, “Wow”! I wish I had art creativity but fortunately my children inherited it! 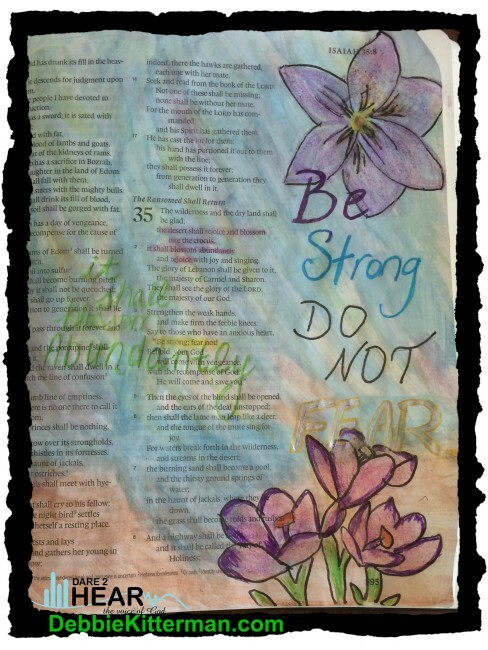 Your idea has given me an idea – Bible art journaling for them. Perfect to learn memory verses and for those times when I read aloud and their fingers need to be moving 🙂 Thank you for sharing this! Carrie – you are so welcome and don’t give up on you being creative to – even how you write the words, or choose which words to underline or which ones to circle is creative. Enjoy taking this idea and making it something for you kids to do too. Beautiful journaling! A whole new way to envision Scripture. Art has never been one of my talents. I’ll put God’s words on a photograph and that will be my artistic expression! I was next to you at Still Saturday. Oh I am in love with this. I am a watercolour artist. I am not in time for your contest but have found a great site – I will be back. If you would like you could link to Sunday Stillnes – where we talk about what God has been teaching us each week. I found you at Tai’s new linkup. This is beautiful! I wish I were creative enough for this but honestly, I just underline my Bible like crazy. Thanks for sharing this with us at Grace & Truth!